Established in 2006, Wix provides small business owners with plenty of valuable site building tools and services. Take just one look at Wix and you’ll realize that it was built to handle a variety of different Ecommerce needs. Like any respectable Ecommerce site builder, Wix understands the importance of presentation. More specifically, they’ve decided to provide retailers with a variety of template options, SEO strategies, and payment options. Wix has Ecommerce plans that start at $12.50/month. This plan alone comes with built in SEO tools, free hosting and even a series of helpful mobile apps. Considering the perks this plan comes with, it’s no surprise that Wix has become one of the most ground-breaking Ecommerce builders on the market. In the Ecommerce world, appearances matter. When it comes to building an Ecommerce site, one of the biggest issues that retailers have is creating a website that manages to look professional without breaking the bank. Having a sleek, polished storefront can be that little extra push that turns that potential customer into a paying one. If you’re a first-time retailer, you probably don’t have much coding/website design experience. Fortunately for you, Wix basically allows you the freedom to be as complex with your storefront design as you like. If you’re ready to start selling products today, Wix has more than 500 templates to choose from. Now, if you’re interested in building a truly unique storefront, you’ll have access to Wix’s innovative drag-and-drop feature, which gives you near unlimited freedom when it comes to building your site from scratch. Again, this site builder is ideal for retailers looking to keep things simple. If you’re interested in editing the HTML or CSS code of your site, you’ll have to go somewhere else. Still, if you’re looking to build a good-looking storefront quickly, Wix is definitely worth checking out. Let’s face it: running a business is far from easy. Running a 24/7, international business like Ecommerce stores are? Well, that can be a downright nightmare if you don’t have the right tools at your disposal. One of the most effective tools in your arsenal is the simplification of transactions. Considering how hard it actually is to get a potential customer to convert, it’s in your best interest to make the transaction process as smooth as possible. How does Wix do when it comes to handling payment integration? From a processing perspective, they do a respectable job. With the 7 most popular payment options covered, 90% of your customers won’t be inconvenienced. Are there other Ecommerce builders with more payment processors? Absolutely, but keep in mind that Wix goes far beyond just giving you dozens of transaction options. Payment integration is about more than just checkout processing. At the end of the day, it’s about making the entire transaction process as painless for you as it is for your customers. For example, Wix provides you with automated customer email notifications. Instead of having to send out a purchase confirmation yourself, Wix instantly handles it. As if that wasn’t enough, Wix offers you a free mobile-friendly storefront (crucial for getting recognized by Google’s search algorithm) with no ads. Through a combination of different services, Wix has managed to create a layered integration system that gives you more time to focus on what really matters. If Google doesn’t know who you are, no one does. For better or worse, we live in a world where being on the second page of Google’s results can have a pretty negative effect on your revenue. Even with the constant changes in the digital marketing landscape, SEO remains a vital part of digital marketing and Ecommerce as a whole. So, how can you tap into the power of SEO? By working with a site builder that understands its value. Right off the bat, Wix helps you cover the most basic SEO techniques. When it comes to titles, descriptions, and keywords, Wix makes the process as simple and straightforward as possible. It may not be revolutionary (most Ecommerce site builders offer this in some degree), but it’s important to give credit where it’s due. Beyond typical SEO practices, Wix also gives you the option to create a more seamless experience on your storefront. If you choose, you can integrate your social media feed directly onto your site. By creating a more cohesive, immersive experience, you’re able to positively reinforce your customers decisions while building a community in the process. Having a community means positive word of mouth/social media presence. This reassures Google that you’re a worthwhile site and makes the race to the first page of Google all the more winnable. While your potential customer’s focus is on presentation and ease of use, your mind should be considering the overall stability of your storefront. Website design is a crucial part of building a site, but so is having a solid infrastructure behind it. Wix makes a point of offering free hosting to all of their payment plans. No matter what plan you choose, Wix will provide you with the same level of security. Beyond the free hosting, they offer the Ecommerce plan members with 20GB of storage and 10GB of bandwidth (more than enough for the average small business Ecommerce retailer). Something to be aware of before using Wix is the fact that their sites lack export options. Their site building technology is just too fundamentally different from other sites. Essentially, if you start a business with them, your storefront as you know it can only be accessed through them. That being said, if you try Wix out and like what you see, you shouldn’t run into any issues with hosting. In the world of Ecommerce retail, there’s always going to be some kind of issue. Ideally, you’ve decided to work with a site builder that puts a premium on being there for you in your time of need. This is where Wix shows a bit of room for improvement. They don’t have a dedicated 24/7 phone line, which is surprising, considering the size of this company. That being said, they offer plenty of online support resources (user guides, tutorials, etc.) and access to a support forum that can help you in 9 different languages. Wix works for businesses that are scaling up by providing users with an all-in-one management system to track orders, promote sales, manage shipping, and most importantly, get paid quickly and easily. 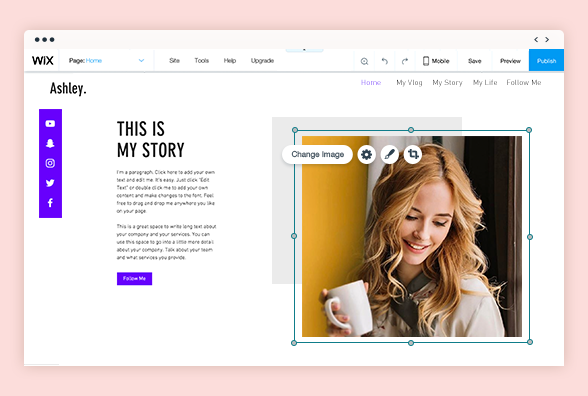 All of these features are on top of the beautiful, customizable templates and flexible store design that has made Wix famous. Users will find it easy to optimize for mobile devices so customers can browse your store anytime, anywhere. Wix has had an interesting reception in the world of Ecommerce site building. On one hand, it’s been heralded as one of the most innovative and customizable services online. Other people have claimed that it’s lack of customer support and hosting stability detracts from its value. Frankly, there’s no denying that Wix can do better. Still, it’s important to recognize what they’re doing well and (more importantly) what they aim to achieve. Wix is building a cost-effective alternative to the more expensive site builders on the market today. 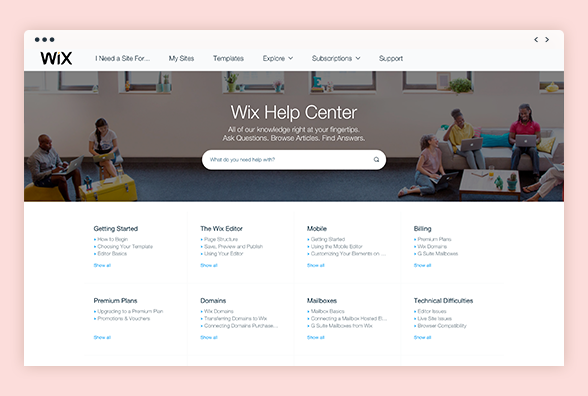 If you’re just getting started as an Ecommerce retailer, make sure to check out Wix. With its focus on design and accessibility, it’s no wonder that Wix is considered one of the best Ecommerce builders money can buy.